As odd as it was being away from my parents over the holiday, I have to admit, I had a great Christmas! I’ve always bugged Bryan about what he looked like when he was younger. 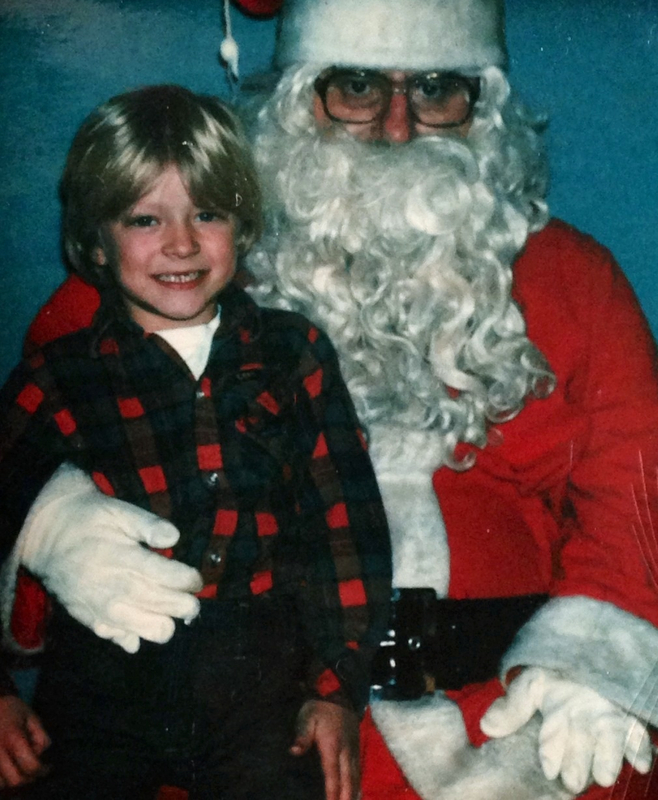 I’ve never had the chance to see photos of him when he was a kid, but while reading on Monday night, I spotted a photo of he and Santa next to me on a table, and I have to tell you, even 5 years old, he was the cutest stinking thing! 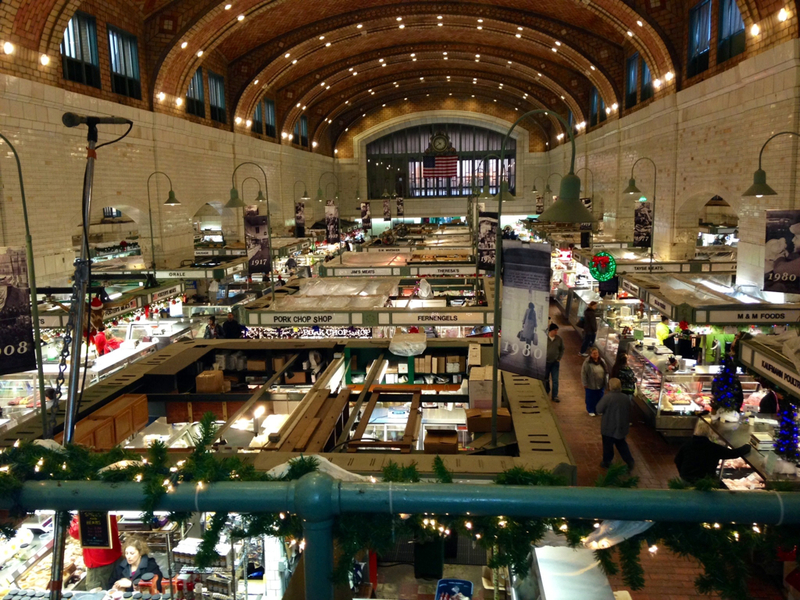 Friday, we I hooked up with our girlfriend Danielle and headed to Ohio City to grab a late lunch at The Great Lakes Brewing Company (of Christmas Ale fame), and the two took me to the West Side Market. I’ve always wanted to go to the market. Those who live in and around Cleveland know that this is the place to go for fresh, local fruits and veggies, meats and seafood. 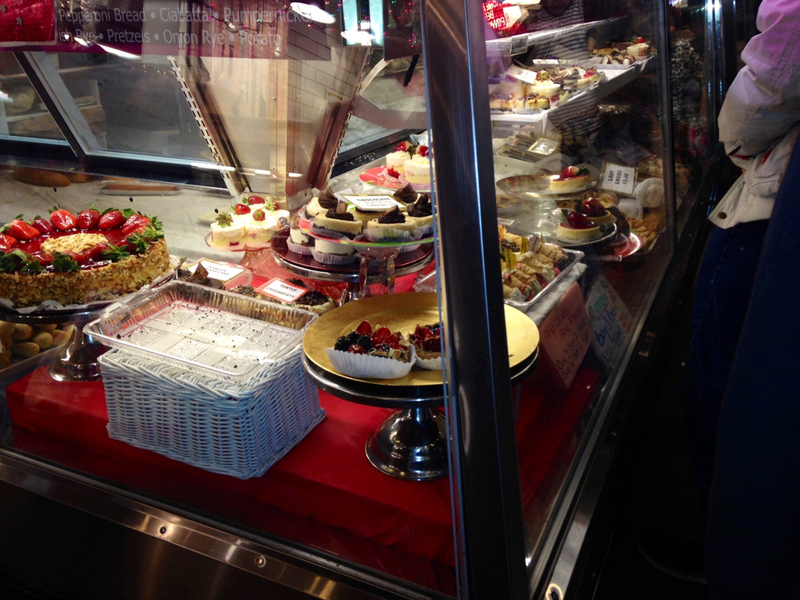 There were coffee booths, freshly made deserts, pirogues, cheese… I bought a lemon cupcake the size of a softball. What I absolutely loved most about the market- other than the incredible selection of hard-to-find foods, like escargot and fresh persimmons- was the architecture! This building is just plain beautiful! 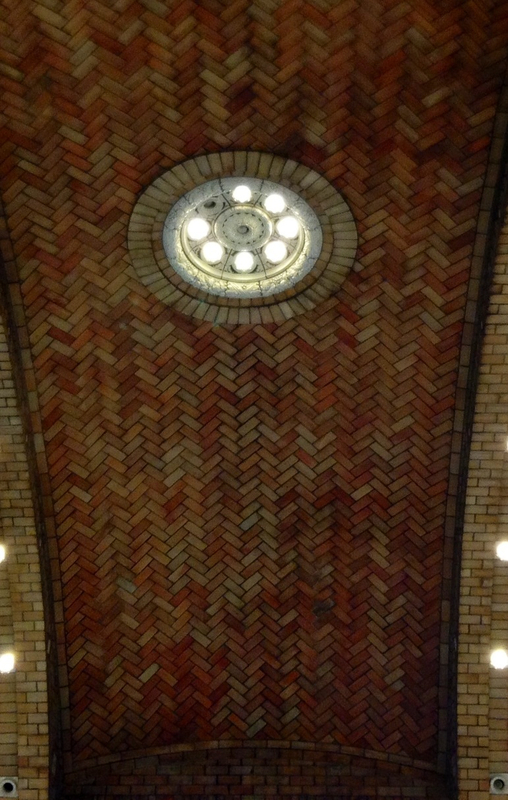 The barrel ceiling was made up of what appeared to be old roadway brick, layed in a herringbone pattern. Each section had a centered ceiling medallion at least 10 feet in diameter. Bryan’s mother says she usually shops here as soon as they open at 7am on Saturdays, and that it’s packed. You have to penguin-walk shoulder to shoulder with other folks bartering over pork chops and homemade fudge (at “Ooooh Fudge,” an homage to locally filmed A Christmas Story, I’m sure), but when we visited, at 4:30 on a Friday afternoon, we had plenty of space to roam, though the lines at the coffee and dessert stands were considerably long. After we left Danielle, Bryan and I headed to the Public Square to see the Christmas lights and hold hands and mosey. 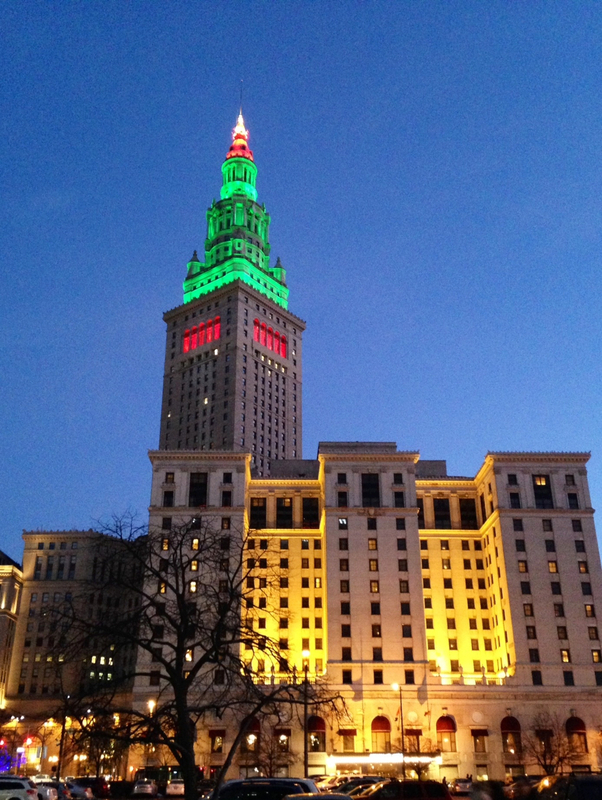 The square was lovely, and for late December in Cleveland, the weather was surprisingly not terrible. We got home tonight, and had just enough energy left to order wings and make out a grocery list for tomorrow before tucking in. Travel always wears me out a bit, but I love getting away from home for a few days. I hope all of you had an incredibly Merry Christmas! 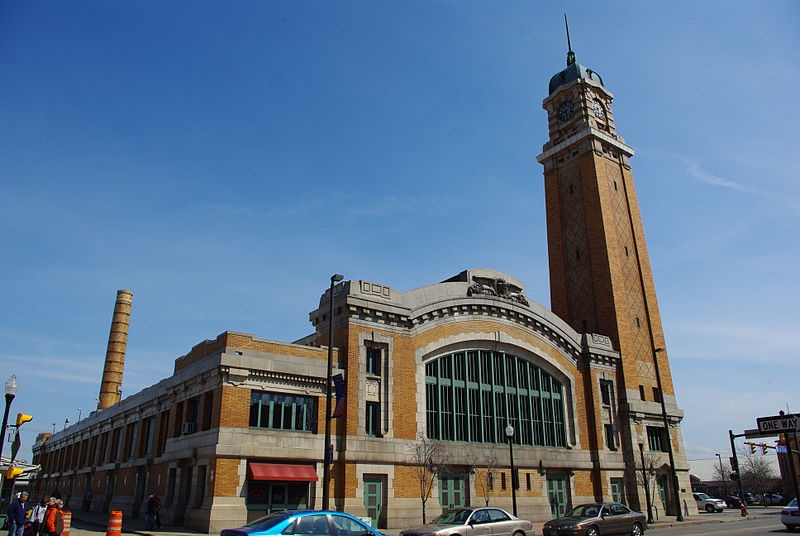 To check out the West Side Market, click here.